TL;DR: This follow up report reviews HubSpot's content trends data with a lens on geography. 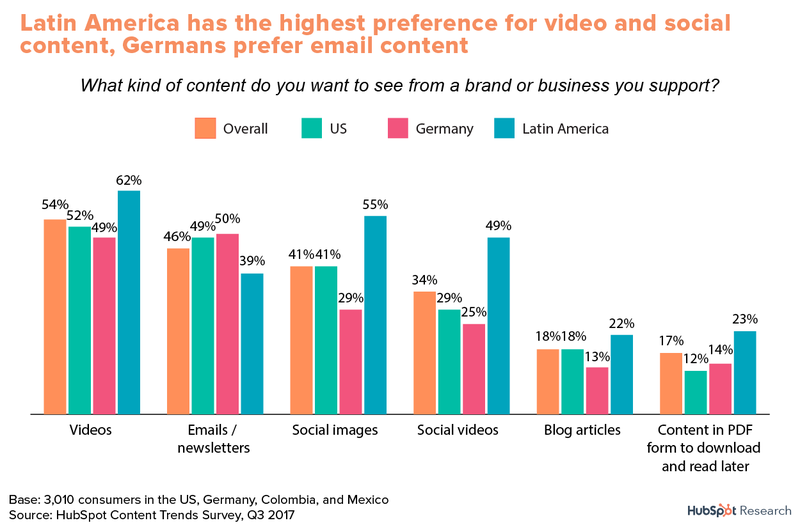 We break down content, video, and search preferences in the US, Germany, Colombia, and Mexico. 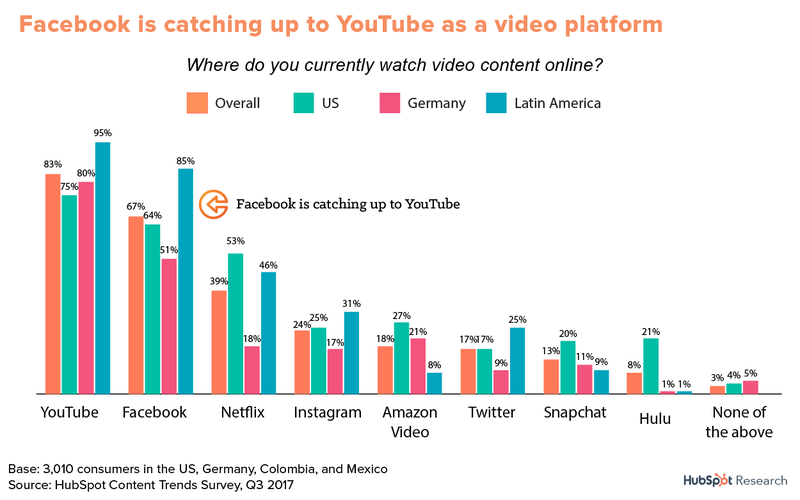 Spoiler: Video content is hugely popular, especially in Latin America. Facebook is Now a Major Content Channel. Ready or Not, Video is Here. When It Comes to Content, Age Matters. A Lot. Preference for Video Extends to Brands. Do Invest In a Mix of Channels and Content - Don’t Ditch Any Specific Channels Today. 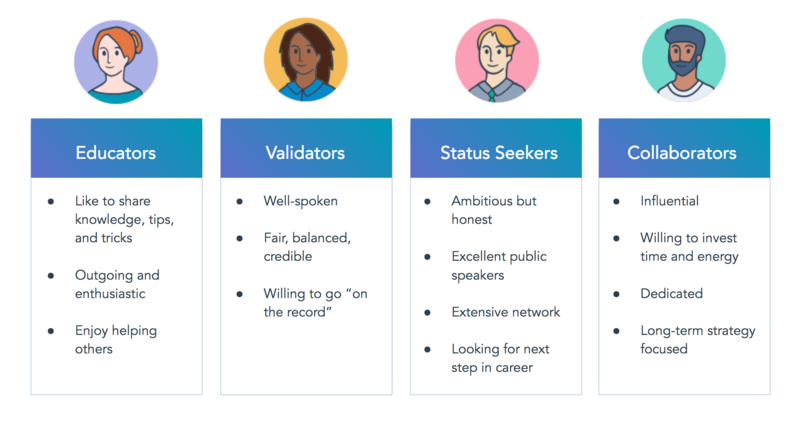 Take Demographics Into Consideration When Staffing Content Teams. This follow up report breaks down responses in the US, Germany, and Colombia and Mexico, which we’ll be referring to as Latin America in the report. Our previous report established a very strong preference for video, especially from a brand or business. Want this chart? Click to download. 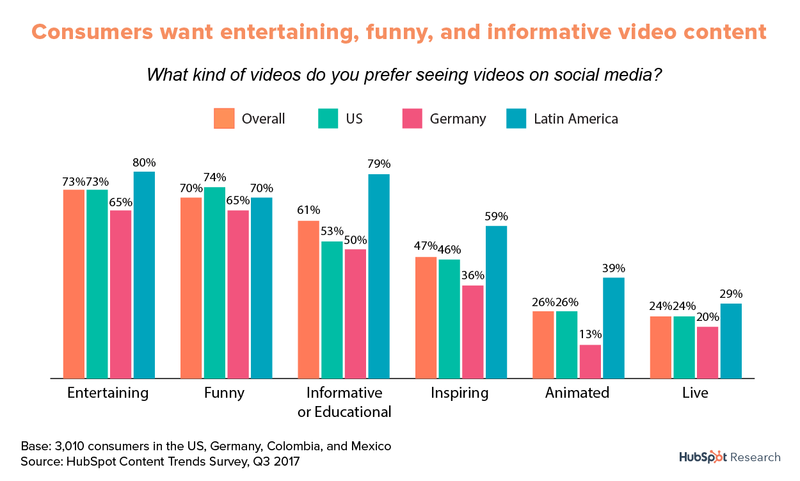 Geographically, Latin American consumers were more enthusiastic about video and social compared to those in the US and UK. They’re also less likely to want email content compared to their peers. Overall, branded video content is the most memorable type of branded content, but there are some striking differences in preference across regions. 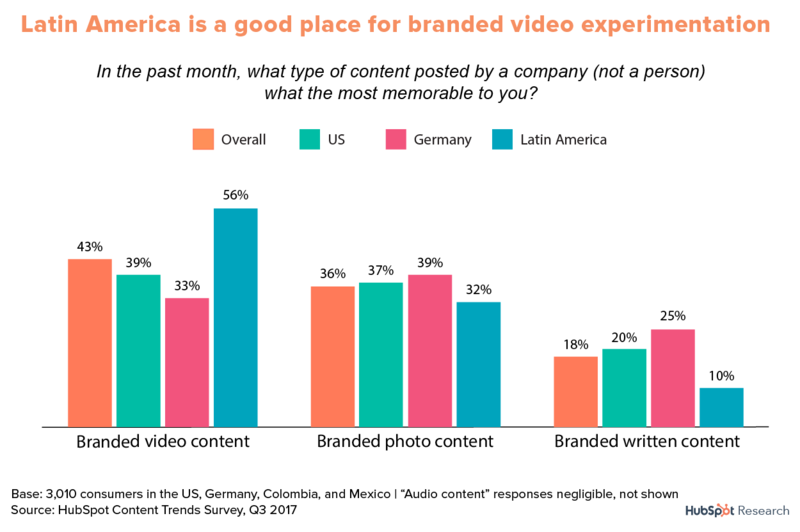 Video is hugely memorable for Latin American consumers, whereas German consumers indicate photo-based content is more memorable. 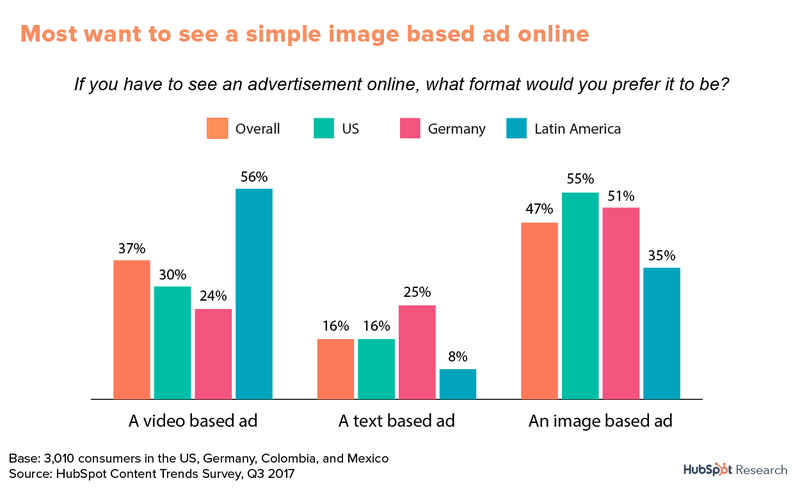 When it comes to general advertising, most in the US and Germany strongly prefer image based ads. Strikingly, video is so popular in Latin America that video based ads rank highest against image and text-based ads. This is a big difference compared to the US and Germany, where video ads are reviled as a particularly annoying type of advertising. Perhaps if online video ads follow the preferred formula of being entertaining, funny, or informative, the medium will win over more consumer viewers (just make sure they’re not autoplaying). Unsurprisingly, YouTube is the most popular channel for video overall. Facebook makes a strong showing, especially amongst Latin American and US-based respondents. Facebook’s pivot to a multimedia company has made serious headway against YouTube. However, Facebook's recent announcement that puts the focus on content shared by friends and family over brands will make distribution and reach much harder for marketers. 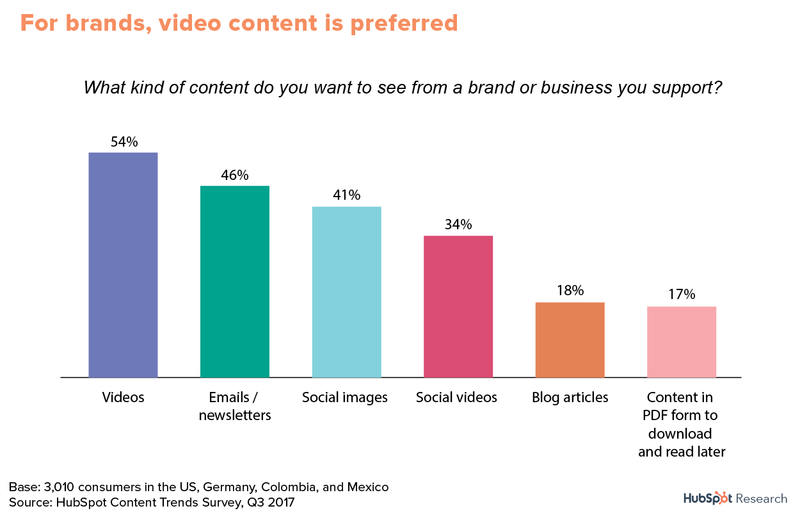 Since brand pages will be de-emphasized, noteworthy branded videos may be one of the few types of branded content that has the potential to be shared en masse by users. But the video has to be worth sharing and commenting on. What types of video content are the most popular? People around world want entertaining, funny, and informative content. The education aspect is surprisingly popular -- 61% of consumers surveyed want to learn something from the videos they see on social media. 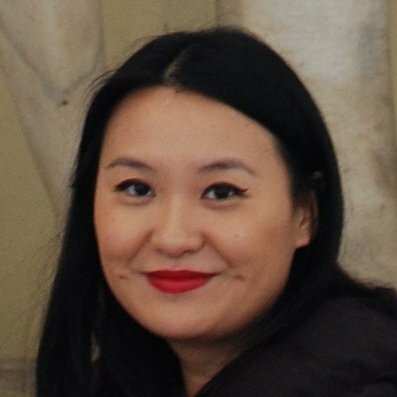 Where do people catch up on stories online? Google and Facebook are now head to head for content discovery. 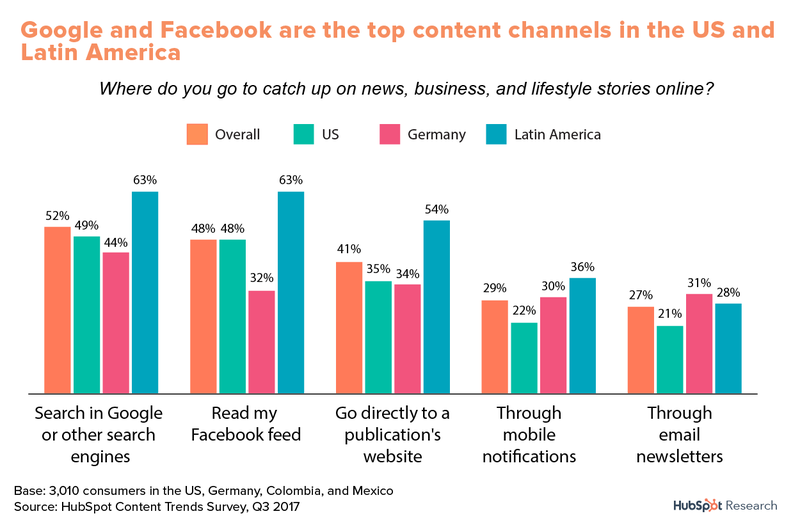 As noted in the first report in this series, content discovery on Facebook is very different from discovery on Google. When one uses Google for content, one has to have an idea of the topic or item they’re searching for. Facebook’s feed allows for passive discovery of content, products, and brands. As a result, optimizing content for Facebook is very different from optimizing content for search engines. 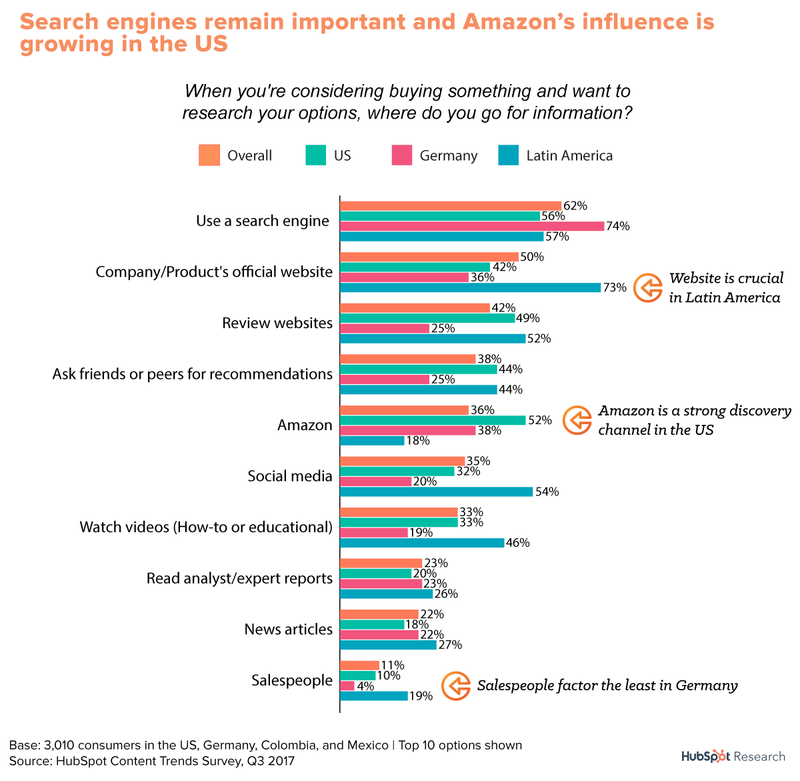 When it comes to research with an intent to buy, official company websites continue to be critically important for consumers, especially in Latin America. Review websites don't seem to factor as highly in Germany, neither does recommendations from friends and peers. Notably, Amazon is very popular for American consumers -- it outranks company websites, review sites, and recommendations from friends or peers. Finally, mobile devices dictate the type of content people seek out on a daily basis. As more use phones as their primary internet device, the preference for video, social content, and messaging based interactions will continue to grow. 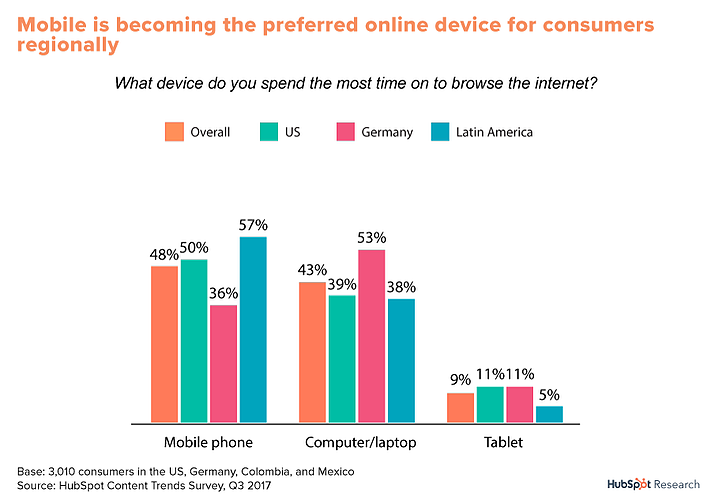 The majority of Latin American respondents are mobile first, and their preferences can be leveraged by marketers looking to experiment. Companies interested in using messaging services will find eager interest in Latin America. Many companies wonder if chat should be used for top, middle, or bottom of the funnel activities. 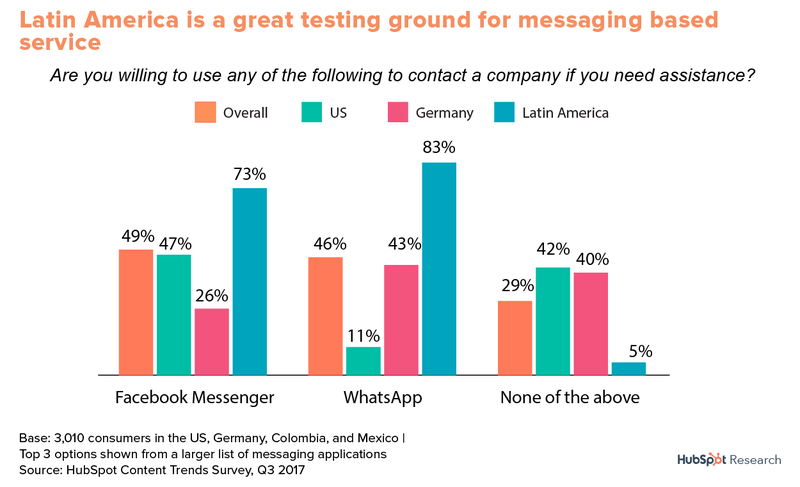 Organizations selling to Latin American countries should experiment with messaging use cases because the Latin American audience are more open to using messaging platforms to interact with businesses. Now is the time to try different use cases in region to discover best practices that can be applied to other geographies. HubSpot Research ran an online survey leveraging a general population panel of adult online consumers via Survey Sampling International. 3,010 respondents from the US, Germany, Colombia, and Mexico make up the sample. The survey was available in English, German, and Spanish and fielded in June 2017. This report contains links for HubSpot Content, Products, and Services. What Will Customer Advocacy Look Like in 3 Years? This is a previously published research report that contains links to HubSpot Products and Services. Learn more about this blog here.